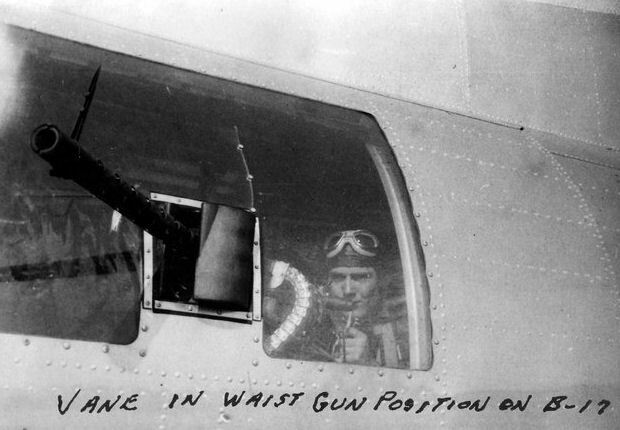 2Lt Ralph E. Whitcomb (P) - Mission #74 flown as Waist Gunner with a 303rd BG(H) Lead Crew, LtCol Kermit D. Stevens (P). Missions 75 and 78 flown as his crews 1st Pilot. Flew no missions after #78. 2Lt Alan Eckhart (CP) - Mission #75 flown with Lt Whitcomb. 25 mission combat tour completed with mission 85 (1 Dec 1943). Was Upgraded from CoPilot to Pilot (3 Nov 43) and flew his last four missions as 1st Pilot. 2Lt Elton L. Jenkins (CP) - Mission 78 with Lt. Whitcomb. 30 mission combat tour completed with mission 142 (27 April 1944). Was upgraded from CoPilot to Pilot and flew his last three missions as 1st Pilot. 2Lt Edward F. Eccleston (N) - Missions 75 and 78 with 2Lt Whitcomb. 25 mission combat tour completed with mission 129 (27 March 1944). 2Lt Robert W. Meagher (B) - Missions 75 and 78 with 1Lt Whitcomb. 25 mission combat tour completed with mission 138 (20 April 1944). Sgt Earl W. Young (LWG) - Missions 75 and 78 with 2Lt Whitcomb. Flew no other 303rd BG(H) combat missions. S/Sgt Fred T. Kuehl (R) - Missions 75 and 78 with Lt Whitcomb. 25 mission combat tour completed with mission 168 (2 June 1944) as T/Sgt. Sgt James R. Teno (BTG) - Missions 75 and 78 with 2Lt Whitcomb. 30 mission combat tour completed with mission 156 (20 May 1944). On mission 78 (14 Oct 1943) to Schweinfurt, Germany a ME-109 20 mm shell exploded against his Ball Turret. Although cut around the face and head by flying glass, he went up to the radio room and filled ammunition cans for the other gunners. S/Sgt William C. Sparks (RWG) - Mission #75 with Lt Whitcomb. Was Killed in action on his 13th dispatched mission , #95 (4 Jan 1944). to Kiel, Germany. His B-17 #42-31526 Sweet Anna (427th BS) GN-V, piloted by 1Lt Fred C. Humphreys was hit by fighters and ditched in the North Sea, killing all of the ten man crew. S/Sgt Owen W. Hadley (RWG) - Mission 78 with 2Lt Whitcomb. 30 mission combat tour completed with mission 156 (20 May 1944). S/Sgt Nyle F. Smith (TG) - Missions 75 and 78 with 2Lt Whitcomb. 30 mission combat tour completed with mission 156 (20 May 1944).